A Review of Carcinogenicity Studies of Asbestos and NonAsbestos Tremolite and Other Amphiboles. John Addison,* and Ernest E. McConnell† *John Addison Consultancy Ltd, Cottingham, Yorkshire, United Kingdom. HU16 4NL, †ToxPath, Inc., Raleigh, NC. Experimental animal studies comparing asbestos and non-asbestos varieties of tremolite indicate tremolite asbestos is markedly more carcinogenic. By direct analogy, the differences in carcinogenicity between tremolite asbestos and non-asbestos prismatic tremolite should be the same for the other types of amphibole that also crystallize in the asbestos and non-asbestos habits. The earliest of the experiment animal studies, done more than 25 years ago, have design limitations by modern standards including the use of injection or surgical implantation as the route of administration rather than the more relevant route of inhalation. However the differences in the carcinogenicity of amphibole asbestos and non-amphibole asbestos are sufficiently large to be clearly discernable even with the study limitations. Together with later studies on these and related minerals, there is strong evidence of a much lower hazard associated with the shorter, thicker fibers of the non-asbestos amphiboles, than is found for the asbestos analogues of the same mineral. It is possible that the non-asbestos amphiboles are no more hazardous than other silicate minerals widely considered nuisance dusts. of fibers is largely independent of length. As a result, the aspect ratio of fibers increases with length. Since the cleavage fragments and asbestiform fibers tend to be morphologically defined by somewhat different crystal surfaces it is tempting to speculate that this may go some way to explaining the apparent differences in toxicological properties as described below. 4. Tremolite, long needle-like crystals from Ala di Stura, N. Italy; 5. Tremolite, short needle-like crystals from Dornie, NW Scotland, Great Britain; 6. Tremolite, prismatic crystals from Shinness, N. Scotland, Great Britain. The tremolite from Korea was the same material as was used in the earlier tremolite inhalation and injection experiments by Davis et al. (1991). The fiber size distributions were assessed by counting and measuring 300 fibers of all sizes in a known weight of sample deposited on to a polycarbonate filter using Scanning Electron Microscopy. At 10,000 times magnification the effective minimum diameter that is visible is 0.1 μm, so the effective minimum length of a counted fiber was 0.4 μm. This was followed by the counting and measurement of a further 100 fibers longer than 5 μm. The data were combined to calculate the numbers of fibers in a series of length and diameter classes in the 10 mg dose administered to the rats. In addition, the numbers of particles (Aspect ratio less than 3:1) were also counted and estimated for each dose. The rats were allowed to live out their full life span or until they showed signs of debility or tumor formation. Statistical analysis of the times at which death from mesothelioma occurred was used to calculate survival curves and these were correlated with the fiber doses received by each animal. Table 3 shows the relative hazard ranking, the numbers of mesotheliomas and the fiber numbers in the doses. The relative hazard was derived from Cox’s proportional hazards model (Cox & Oakes 1984) and is a function of the numbers of animals developing mesothelioma and their median survival times. The values given in the table differ from those shown in Davis et al. (1991) only in that the hazard is expressed arithmetically as a multiple of the lowest hazard, and the fiber numbers are expressed as those in the dose. The Stanton studies confirmed the high tumorigenicity of tremolite asbestos and identified the Stanton Fiber range, fibers > 8 μm with diameters < 0.25 μm, for which the correlation between fiber numbers and mesothelioma generation was highly significant. Had the size classes and instillation method been different, the ‘Stanton Fiber’ critical size may well have been different. The authors stated that shorter and thicker size classes also correlated with mesothelioma potency, and that it should not be assumed that they had no potency. However, as can be seen in Figure 7, the numbers of fibers in the different classes are strongly correlated. So it is to be expected that if the tumorigenicity is correlated strongly with numbers in the long, thin class of fibers it will also correlate with the fiber numbers in the shorter classes. That does not necessarily imply a causal relationship, and these short fibers may indeed have insignificant tumorigenicity. Even particulates that are considered relatively innocuous, e.g. FeO, magnetite can produce tumors by injection techniques if the dose is high enough (Pott et al. 1991). As can be seen in Figure 8 many of the mineral and glass fibers in the experiments had less than 10 % probability of generating mesothelioma despite having huge numbers of fibers in the administered dose in the size range of 4 –8 μm length with no fibers in the longer classes. It is noteworthy; the fibrous talc minerals (5 and 7) produced no tumors despite having large numbers of short, thin fibers. The halloysites produced only 5 and 4 tumors despite having among the highest numbers of short fibers. Halloysite has the same tubular morphology as chrysotile asbestos despite having a little thicker fundamental diameter (0.07 μm). The attapulgites (palygorskite) produced few (2/29) tumors with similarly high numbers of fibers shorter than 8 μm. However, one long fiber attapulgite has been found by Wagner et al. (1987) to be capable of producing large numbers of mesotheliomas in rats by intraperitoneal injection. Both halloysite and attapulgite have been described as asbestiform but neither fiber-type is asbestos. types and concepts of carcinogenic activity. But positive results are of limited use as predictors of the risk to humans from inhalation of more general dusts. Furthermore, the doses to which the animals are exposed are probably many orders of magnitude higher than would be expected from exposure of humans to airborne dust. CONCLUSIONS The conclusion that should be drawn from the evaluations of this set of studies is that there is very little evidence of carcinogenicity from exposure of animals to mineral fragments or short fibers formed from normal prismatic amphibole minerals. No positive carcinogenicity has been found with any experiment using non-asbestos amphibole dust (Ilgren 2004). Furthermore, when genuinely short fiber amphibole asbestos has been used in inhalation or injection experiments they have also been shown to have no carcinogenic properties. Evidence from experiments with other mineral fibers suggests those fibers in excess of 20 μm and with diameters less than 1 μm are necessary to cause cancer. This is probably because such long fibers cannot be phagocytized by resident macrophages and therefore, cannot be removed from the lung (Lippmann et al. 2000). This explains the lack of carcinogenicity of cleavage fragment fibers of amphiboles since these rarely if ever contain fibers of these critical dimensions. ACKNOWLEDGEMENTS The authors are grateful to the National Stone, Sand and Gravel Association of the United States for financial support in the preparation of this document. The authors would like to thank to Dr. R.P. Nolan for helpful comments during editing. References Addison, J., Davies, L.S.T. (1990). Analysis of amphibole asbestos in chrysotile and other minerals. Ann. Occup. Hyg. 34, 159-175. Asbestos Textile Institute. (1971). Measurement of airborne asbestos fiber by the membrane filter method. Asbestos Textile Institute, Pompton Lakes, N.J. Asbestosis Research Council (1969). Technical Note No. 1, Measurement of Airborne Asbestos Dust by the Membrane Filter Method, Asbestosis Research Council, Rochdale, England. Berman, D.W., Crump, K.S., Chatfield, E.J., Davis, J.M.G., Jones, A.D. (1995). The shapes sizes and mineralogy of asbestos structures that induce lung tumors or mesothelioma in AF/HAN rats following inhalation. Risk Analysis. 15, 181-195 Brown, G.M., Cowie, H., Davis, J.M.G., Donaldson, K. (1986). carcinogenic mineral fibers: a comparison of two assays and the role of fiber size. Carcinogenesis 7, 1971-1974. Campbell, W.J., Steel, E.B., Virta, .R.L., Eisner, M.H. (1979). Relationship of mineral habit to size characteristics for tremolite cleavage fragments and fibers. U.S. Bureau of Mines Report of Investigation No. 8367. Coffin, D.L., Palekar, L.D., (1978) EPA Study of biological effects of asbestos-like mineral fibers. In National Bureau of Standards Special Publication 506. 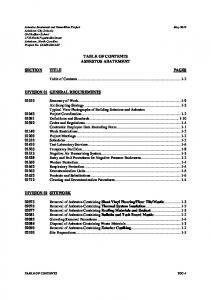 Proceedings of the Workshop on Asbestos: Definitions and Measurement Methods held at NBS, Gaithersburg. 163-177. Coffin, D.L., Palekar, L.D., Cook, P.M. (1982). Tumorigenisis by a ferroactinolite mineral. Coffin, D.L., Palekar, L.D., Cook, P.M. (1983). Correlation of in vitro and in vivo methods by means of mass dose and fiber distribution for amosite and fibrous ferroactinolite. Environ. Health Perspect. 51, 49-53. Cook, P.M., Palekar, L.D., Coffin, D.L. (1982). Interpretation of the carcinogenicity of amosite asbestos and ferroactinolite on the basis of retained fiber dose and characteristics in vivo. Toxicol. Lett. 13, 151-158. Cox, D.R., Oakes, D. (1984). Analysis of Survival Data. Chapman & Hall. London. Davis, J.M.G., Addison J., McIntosh, C., Miller, B.G., Niven, K. (1991). Variations in the carcinogenicity of tremolite dust samples of differing morphology. Ann. N. Y. Acad. Sci. 643, 473-490 Davis, J.M.G., Addison, J., Bolton, R.E., Donaldson, K., Jones, A.D., Smith, T., (1986). The pathogenicity of long versus short fiber samples of amosite asbestos administered to rats by inhalation and intraperitoneal injection. Br. J. Exp. Pathol. 67, 415-430 Davis, J.M.G., Addison, J., Bolton RE, Donaldson K, Jones AD, Miller BG. (1985). Inhalation studies on the effects of tremolite and brucite dust in rats. Carcinogenesis 5, 667-674. Davis, J.M.G., Beckett S.T., Bolton R.E., Collings P., Middleton A. P. (1978). Donaldson, K., Szymaniec, S. Li, X.Y., Brown, D.M., Brown, G.M. (1991). Inflammation and immunomodulation caused by short and long amosite asbestos samples. In: Mechanisms in Fiber Carcinogenesis, (Brown, R.C., Hoskins, J.A., Johnson, N.F., Eds), Plenum Press, New York, pp. 287-307. Donaldson, K., Li, X.Y., Dogra, S., Miller, B.G., Brown, G.M. (1992). Asbestos-stimulated tumour-necrosis-factor release from alveolar macrophages depends on fiber length and opsonization. J. Patho. 168, 243-248. Donaldson, K., Golyasnya, N. (1995) Cytogenetic and pathogenic effects of long and short amosite asbestos. J. Pathol. 177, 303-7. Dorling M, Zussman J. (1987) Characteristics of asbestiform and non-asbestiform amphiboles. Lithos 20, 469-489. Federal Register (1992) Occupational exposure to asbestos, tremolite, anthophyllite and actinolite; Final Rule. 29 CFR Parts1910 and 1926. Guthrie, G.D., Mossman, B.T. (1993) Health Effects of Mineral Dusts. Reviews in Mineralogy, Volume 28, Mineralogical Society of America, Washington, D.C., pp 555-576. Hill, I.M., Beswick, P.H., Donaldson, K. (1995) Differential release of superoxide anions by macrophages treated with long and short-fiber amosite asbestos is a consequence of differential affinity for opsonin. Occup Environ Med. 52, 92-96 Hwang, C.Y., Gibbs, G.W. (1981) The dimensions of airborne asbestos fibres- I. Crocidolite from the Kuruman area, Cape Province, South Africa. Ann. Occup. Hyg. 24, 23-41 Ilgren, E., Chatfield, E. (1998). Evidence for lack of tumourigenic activity. Indoor Built Environ. 7, 18-31. Ilgren EB (2004) The biology of cleavage fragments: A brief synthesis and analysis of current knowledge, Indoor Built Environ. 13,343-356. Jaurand, M-C. (1991) Mechanisms of fibre genotoxicity. In: Mechanisms in Fiber Carcinogenesis, (Brown, R.C., Hoskins, J.A., Johnson, N.F., Eds), Plenum Press, New York, pp. 287-307. Kane, A.B. (1991) Fiber dimensions and mesothelioma: a reappraisal of the Stanton Hypothesis. In: Mechanisms in Fiber Carcinogenesis, (Brown, R.C., Hoskins, J.A., Johnson, N.F., Eds), Plenum Press, New York, pp. 131-141. Langer AM, Nolan RP, Addison J (1991) Distinguishing between amphibole asbestos fibers and elongate cleavage fragments of their non-asbestos analogues In: Mechanisms in Fibre Carcinogenesis, (Brown RC, Hoskins JA, Johnson NF Eds), Plenum Press, New York, pp 253267. Leake, B.E., Wooley, A.R., Arps, C.E.S., Birch, W.D., Gilbert, W.D., Grice, J.D., Hawthorne, F.C., Kato, A., Kisch, H.J., Krivovichev, V.G., Linthout, K., Laird, K, Mandarino, J.A., Maresch, W.V., Nickel, E.H., Rock, N.M.S., Schumacher, J.C., Smith, D.C., Stephenson, N.C.N., Ungaretti, L., Whittaker, E.J.W., Youzhi, G. (1997) Nomenclature of amphiboles: Report of the Subcommittee on Amphiboles of the International Mineralogical Association, Commission on New Minerals and Mineral Names. Min. Mag. 61, 295-321. Leake, B.E., Wooley, A.R., Birch, W.D., Burke, E.A.J., Ferraris, G., Grice, J.D., Hawthorne, F.C., Kisch, H.J., Krivovichev, V.G., Schumacher, J.C., Stephenson, N.C.N., Whittaker, E.J.W., (2004) Nomenclature of amphiboles: additions and revisions to the International Mineralogical Association's amphibole nomenclature. Min. Mag. 68 (1), 209-215. Lippmann, M., Chiazze, L., Coultas, D.B., Driscoll, K.E., Kane, A.B., Lockey, J.E., McConnell, E.E., Oberdörster, G., Rhomberg, L.R., Utell, M., and Warheit, D.B. (2000). Biological Effects of Man-made Mineral Fibers. Oberdörster, G., Lehnert, B.E. (1991). Toxicological aspects of the pathogenesis of fiber-induced pulmonary effects. Mechanisms in Fiber Carcinogenesis, (In: Brown, R.C., Hoskins, J.A., Johnson, N.F., Eds), Plenum Press, New York, pp. 157-179. Pott, F., Huth, F., Friedrichs, K.H. (1974). Tumorigenic effects of fibrous dusts in experimental animals. Env. Health Perspect. 9, 313-315. Pott, F., Roller, M., Ziem,.U., Reiffer, F-J., Bellmann, B., Rosenbruch, M., Huth. F. (1989). Carcinogenicity studies on natural and man-made fibers with the intraperitoneal test in rats. In: Non-occupational Exposure to Mineral Fibers. (Bignon, J., Peto, J., Saracci, R. Eds), IARC Scientific Publications No. 90. International Agency for Research on Cancer. Pp.173-179. Pott, F., Roller, M., Rippe, R.M., Germann, P-G., Bellmann, B. (1991). Tumours by the intraperitoneal and intrapleural routes and their significance for the classification of mineral fibers. In: Mechanisms in Fiber Carcinogenesis, (Brown, R.C., Hoskins, J.A., Johnson, N.F., Eds), Plenum Press, New York, pp. 547-565. Searl, A., Buchanan, D., Cullen, R.T., Jones, A.D., Miller, B.G., Soutar, C.A. (1999). Biopersistence and durability of nine mineral fiber types in rat lungs over 12 months. Ann. Occup. Hyg. 43, 143-153. Smith, W.E., Hubert, D.D., Sobel, H.J., Marquet, E. (1979). Veblen, D.R., Wylie, A.G. (1993) Mineralogy of Amphiboles and 1:1 layer Silicates. In: Health Effects of Mineral Dusts. Reviews in Mineralogy, (Guthrie, G.D., Mossman, B.T. Eds) Mineralogical Society of America, Volume 28, pp. 61-137. Wagner, J.C., Griffiths, D.M., Munday, D.E. (1987). Experimental studies with palygorskite dusts. Br. J. Ind. Med. 44,749-63. Wagner, J.C., Berry, G.B., Hill, R.J., Munday, D.E. and Skidmore, J.W. (1984). experiments with MMMV F - Effects of inhalation and intrapleural inoculation in rats. In: Biological Effects of Man-made Mineral Fibers. World Health Organization, pp. 209-232. Wagner, J.C., Chamberlain, M., Brown, R.C., Berry, G., Pooley, F.D., Davies, R., Griffiths, D.M. (1982). Biological effects of tremolite. Br. J. Cancer 45, 352-360. WHO. (1985). Reference methods for measuring man-made mineral fibers MMMF. Prepared by WHO/EURO Technical Committee for evaluating MMMF, WHO Regional Office, Copenhagen, Denmark. Wylie, A.G., Bailey, K.F., Kelse, J.W., Lee, R.J. (1993). The importance of width in asbestos fiber carcinogenicity and its implications for public policy. J. Am. Ind. Hyg. Assoc. 54-5, 239252. Figure 1. Typical prismatic form of amphibole showing main cleavages and prism faces. Figure 1b. Scanning Electron Microscope microphotograph of Ala di Stura tremolite showing a large prismatic crystal with cross section with a cross section shape determined by (110) crystal faces; also evident are the traces of the (100) cleavage planes. Thin asbestiform tremolite fibers with diameters finer than 1 micron are also visible on the right hand side of the image. Figure 2. Length and width distribution of fibers (microns) in elutriated respirable dust of the Korean Tremolite Asbestos. This is a typical asbestos fiber size distribution with most fibers less than 5 microns in length and less than 0.5 microns in diameter. There are however some thin fibers with length greater than 10 microns, and some cleavage fragment fibers with diameters greater than 1 micron. Figure 3. The probability of fibre generating a tumour compared to the log of numbers of fibre per microgram longer than 8 microns with diameter greater than or equal to 0.25 microns. This is the same data as in Stanton et al (1981). Report "A Review of Carcinogenicity Studies of Asbestos and Non- Asbestos Tremolite and Other Amphiboles"